Flagler College-St Augustine received a B.
Washington Monthly's ranking of 110 out of 346 of Baccalaureate Colleges - Overall Rank was a major contributor to this grade. Resort hotels are great, especially when you're not paying the expensive rates, and 500 students at this college four miles from the Atlantic beaches of St. Augustine live in fancy Ponce De Leon Hall, a former hotel on the National Register of Historic Places. While living the life of luxury, students at Flagler can major in liberal arts or pre-professional programs. Describe the type of student who should not attend Flagler College-St Augustine and explain why. Describe the type of student who should attend Flagler College-St Augustine. Why? What are 5 things you do and don't enjoy about Flagler? What reasons do students give for transferring out of Flagler? What is a typical Flagler College-St Augustine student like? Describe the type of person that should attend Flagler College-St Augustine. What are the top 3 reasons someone should attend Flagler College-St Augustine? What was a typical Flagler College-St Augustine student like in high school? Describe the type of person that should attend Flagler College-St Augustine. Flagler is not top-tier when it comes to selectivity, and strong candidates should meet little resistance. Welcome to Flagler College! When I joined the staff of Flagler College in 1971, the College was in its infancy. By the time I became president in 2001, Flagler had established itself as a well-respected institution of higher education. Our reputation for providing quality education continues to grow, and we remain one of the most reasonably priced private colleges in the nation. Today, our campus is a vibrant place with more than 2,500 students representing 47 states and more than 20 foreign countries. Not only do students come to Flagler to earn a degree, but they also come to have an "educational experience," one that is enriched by the size of our college, the quality of our programs and services, the commitment of our talented and dedicated faculty and staff, and the ideal location in St. Augustine - the nation's oldest city. During the past ten years, the College has broadened its reach by establishing an extended campus in Tallahassee and by offering an evening degree program in Public Administration. In the fall of 2009, the extended campus in Tallahassee and the Public Administration in St. Augustine had a combined enrollment of 578 students, bringing the total enrollment to 3,100 students. Growth has not been limited to increases in enrollment. In just the last five years, we have constructed the Ringhaver Student Center, the Crisp-Ellert Art Museum, and the Cedar Street men's residence hall. In addition, we have renovated and expanded the Molly Wiley Art Building and acquired the Florida's East Coast Railway buildings. Two of the three FECR buildings have been converted into residence halls, and plans are underway to renovate the third building. This summer, we are renovating more than 30 dormitory rooms in Ponce de Leon Hall, constructing a new campus plaza on the West Lawn, making improvements to the Fitness Center in the Gymnasium, and constructing a new locker room facility at Flagler Field. We have also strengthened our athletic programs by changing our athletic affiliation to the NCAA Division II and by joining the Peach Belt Conference. In our first year of competing in the PBC, we won three conference championships. The College is committed to historic preservation and has expended more than $30 million in maintaining and preserving its historic buildings. Twelve of the campus buildings are classified as historic buildings; two are listed in the National Register of Historic Places, and one is designated as a National Historic Landmark. But Flagler College is much more than just bricks and mortar. Our students enjoy the personal attention and guidance they receive from their professors, and they feel a sense of pride that extends beyond graduation. Many of our alumni often talk about being part of the Flagler Family and feel a deep, personal connection to their alma mater. Flagler students are well prepared to pursue meaningful careers, to further their education in graduate or professional schools, and to assume positions of leadership in their communities. In the final analysis, I believe that it is the people on our campus who are responsible for the success we have enjoyed and progress that we have made in recent years. Our trustees, administrators, faculty, staff, alumni, and benefactors are dedicated to helping us achieve our mission and our goals. Foremost among these aims is to educate students and to prepare them for meaningful careers, further education, and lifelong learning. What are the top 3 things that students do for fun at Flagler College-St Augustine? Campus housing is available for undergraduates and is mandatory for freshman. Housing deposit : $200.00. Housing deposit due : May 1. Housing deposit is not refunded if student does not enroll.. Freshman allowed to have car. No pets. Does Flagler College offer college credit for AP courses? The average student pays $20,910 for tuition, fees, and other expenses, after grants and scholarships. Total stated tuition is $16,180, in-state and on-campus, before financial aid. Learn more about financial aid at http://www.flagler.edu/admission-aid/financial-aid/. Estimate the net price for you at http://www.flagler.edu/admission-aid/financial-aid. Flagler College-St Augustine participates in the NCAA Division II for college athletics. 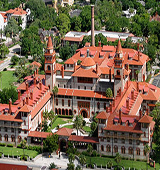 Want more info about Flagler College-St Augustine? Get free advice from education experts and Noodle community members. Do they have deaf kids?